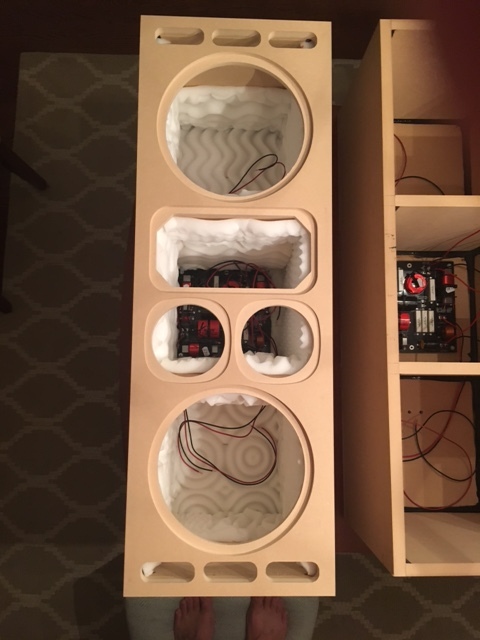 This is the second set of speakers I've ever built. This is one of the last things I have to do for my theater room. Hopefully this thread would help people in the future as well as help me finish these things off over the course of this week. 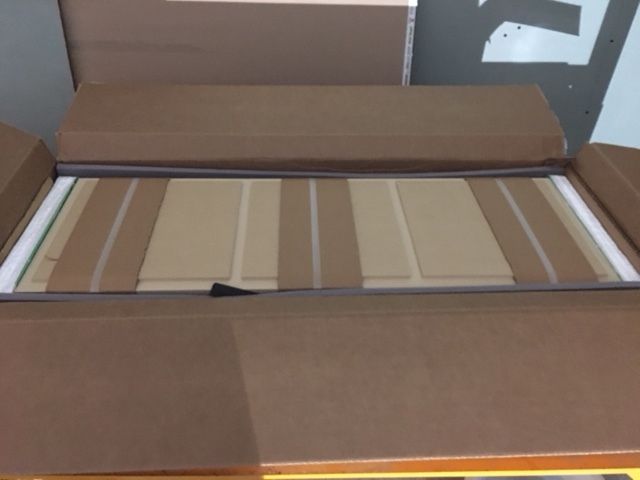 Here is how they came packed - unbelievable job. I've never received a package with more attention to detail. 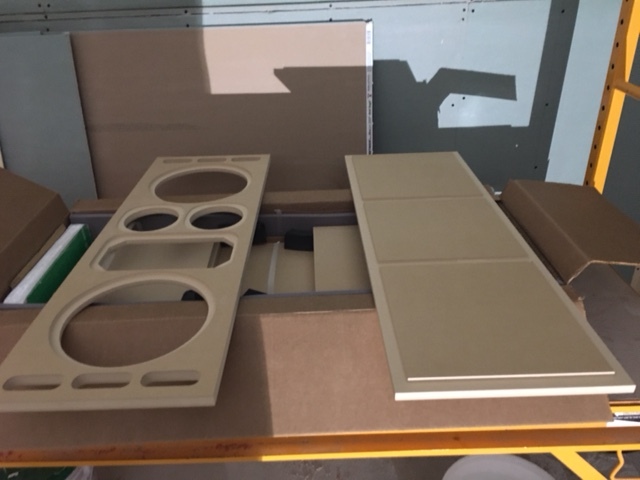 First step is to assemble the boxes. I glued and clamped the first one and was not happy with the results (nothing I can't fix during finishing) so the other two were assembled with brads and glue. The seams didn't come together like I had hoped - even with all the weight and the clamps. It's not as bad as it looks though. Some Ready Patch and some sanding will take care of this pretty easily. cardoski, eng-399, 18Hurts and 1 others like this. The crossovers were not too bad to put together. 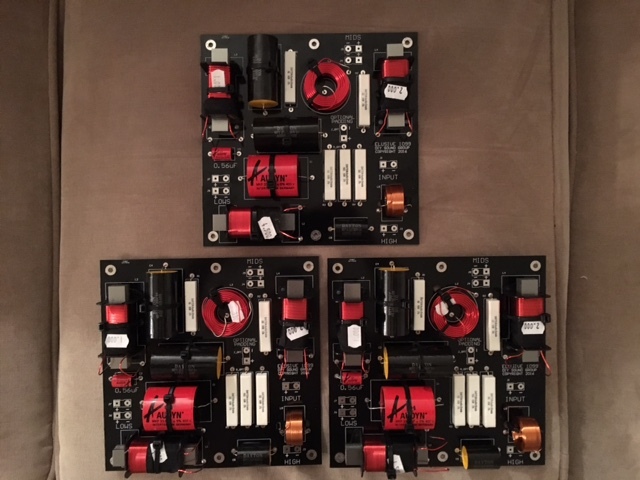 Having cut my teeth on the Volt 6s I was feeling pretty good about soldering and having it all work. 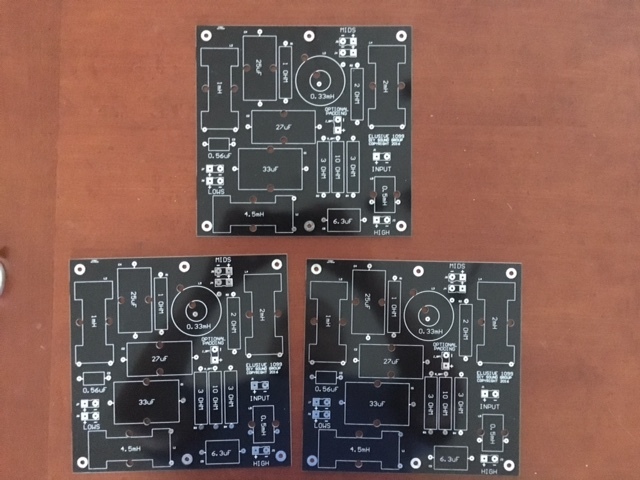 That said, this was 1000 times easier thanks to @ja00 - he hooked me up with three PCBs and it made things go very smooth. Big thanks to him! I wish I had more pics of this part but I was trying to get this done quick while I had the house to myself. The first thing I did was dryfit all of the components. Then I used a glue gun to hold everything down so I could flip the board over to solder. This is what it looked like after I finished - I used 8 zip ties to hold everything down as well. This is what the board looked like post-soldering but before I snipped the excess wire off of each solder point. Here are the 3 boards all soldered but not wired yet. 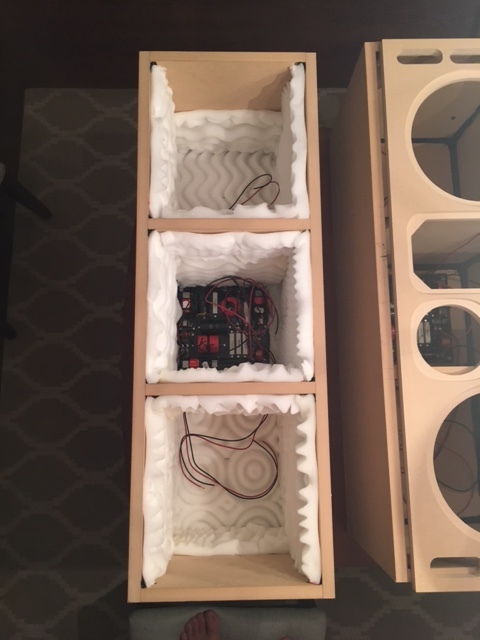 That's next along with working on the speaker boxes. They came out pretty good - the boards made it easy. nlpearman, vipervick, cardoski and 2 others like this. Next up was wiring the crossovers and testing them out to make sure they worked. 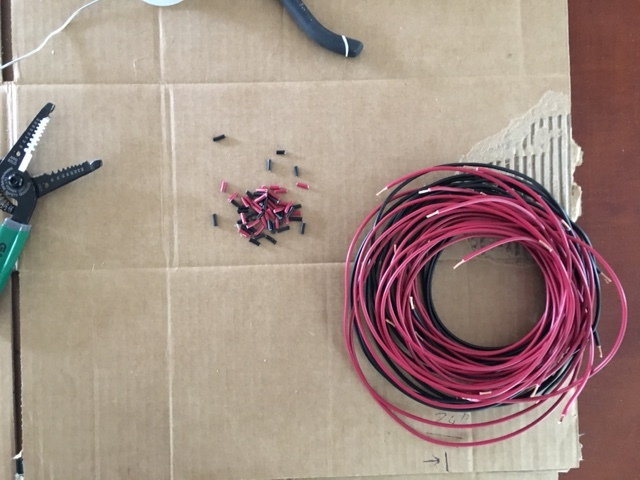 I cut 2 ft. lengths of 16 gauge wire for everything - this was a mistake. I could have gone shorter on the mid and the high wires and longer on the lows. 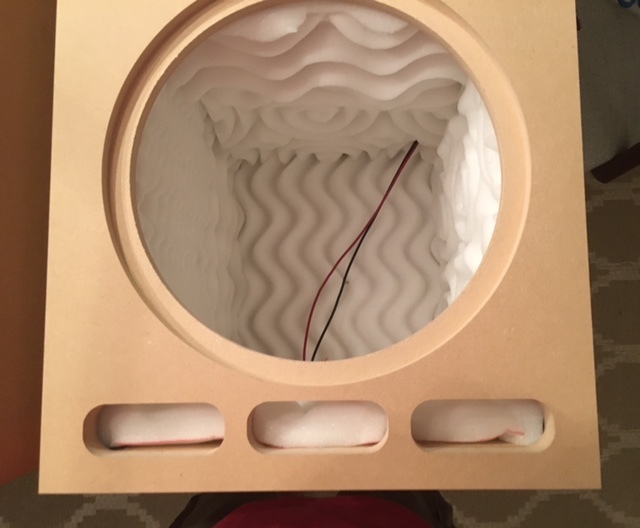 This is really only going to be an issue on the lows, obviously but 2 ft. is going to be real close as to whether I can connect the woofers or not. I'm a little nervous but I assume that I can just add more wire and some shrink tube or electrical tape and it will be a non issue. Here's the assembly line. I used black for "-" and red for "+" which I think is pretty standard. Does anyone's fingers hurt after doing this? Working with the tool on the left that I don't even know the name of (wirecutter?) really makes my hands cramp up after 30 minutes of continuous work. Of course, I don't have any pics of the boards with the wires but it's not hard to imagine so here's a shot of the next step showing the spaghetti mess as I tested the crossovers. Next up - actual testing! They all sound fantastic. I can't wait to hear them when the speakers are finished. 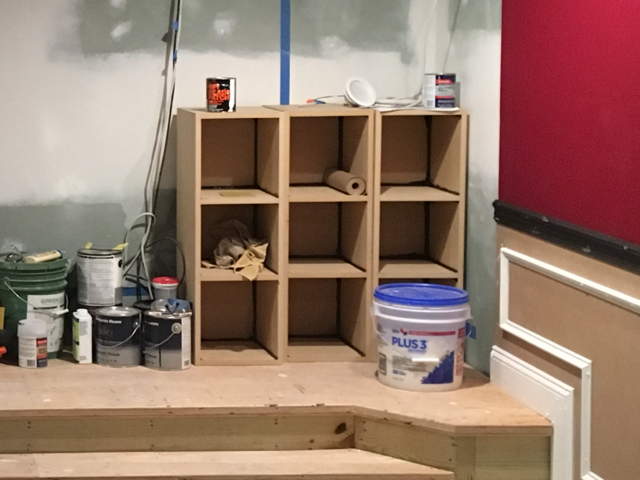 Next up is mounting the crossovers inside of the cabinets. Before mounting the crossovers, I caulked all of the inside seams (black) of each cabinet. This is, unfortunately, the best shot of this that I have although you'll see more as I work on them. I just checked out (albeit very quickly) your theater build...good stuff. How do you plan on finishing these? Or are they going behind a screen? unretarded and mikeTRON250LM like this. 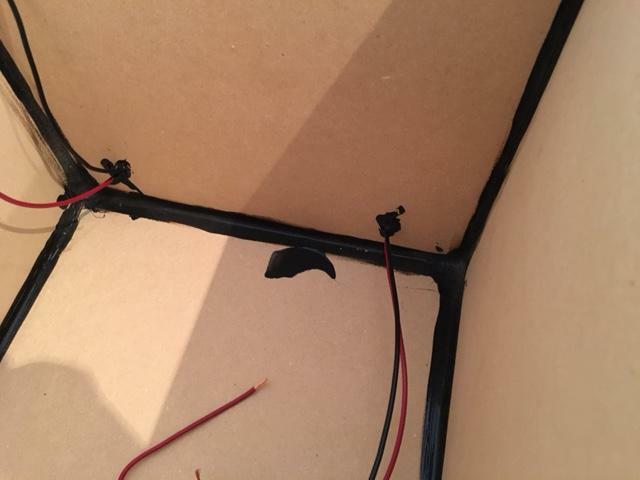 Does anyone run into an issue when adding the 1" foam to the inside of the cabinet? 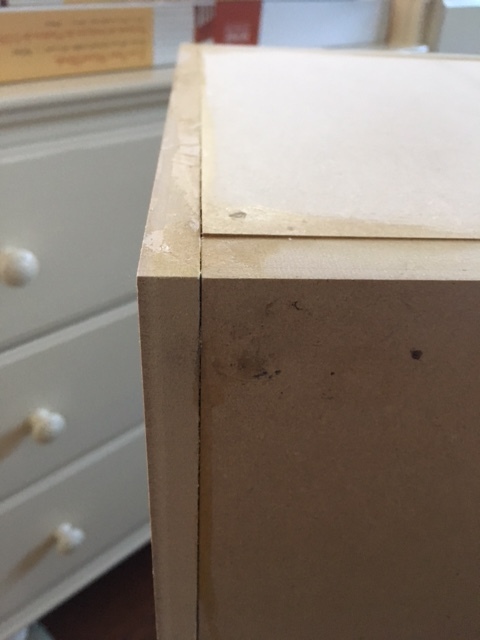 THe foam seems to be in the way of where the ports will be but if I remove the foam here there will be nothing lining the top and bottom of the cabinet. I guess I could try to squish the foam down - will that work? cardoski and mikeTRON250LM like this. To my surprise everybody I talk to hates them, if I have to cut 30 wires and strip them there is no better tool to do so. I've probably cut and stripped 1,000's of cables and it's still good. Ha! 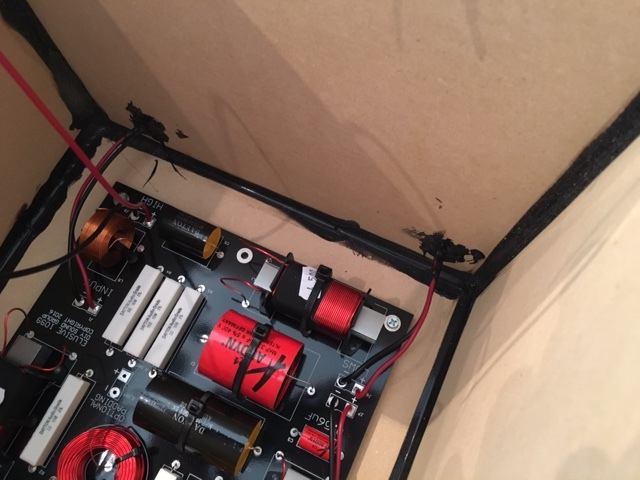 Well that's good to know before I glued the front panel on. So the bottom front under/around the ports has NO padding? That thing looks great - I wish I had known about it 3 months ago - I definitely would have bought one. Thanks guys - this is very helpful! How much polyfil should I use to fill the cavities once I'm closing everything up? Does it need to be on the dense side of things or just loosely fill the void? Next thing I managed to get done was mounting the crossovers. I chose the back wall of the center chamber - just seemed like the logical place for it. 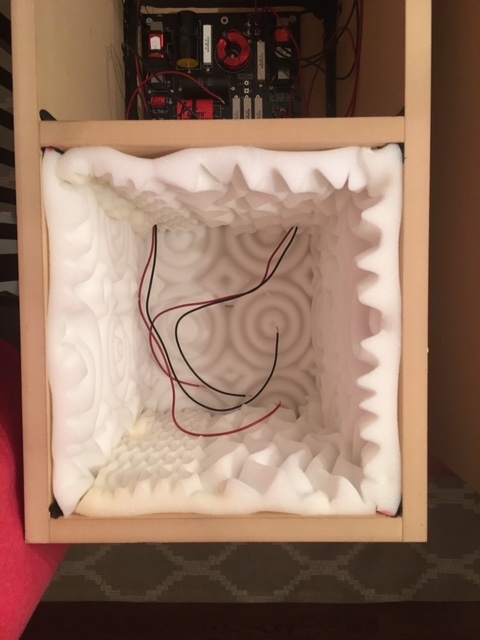 The first thing I did was drill holes so that I could get wires to the other chambers from the center so that I could wire the woofers and also for the binding posts, which I decided to put in the bottom chamber sticking out of the back. 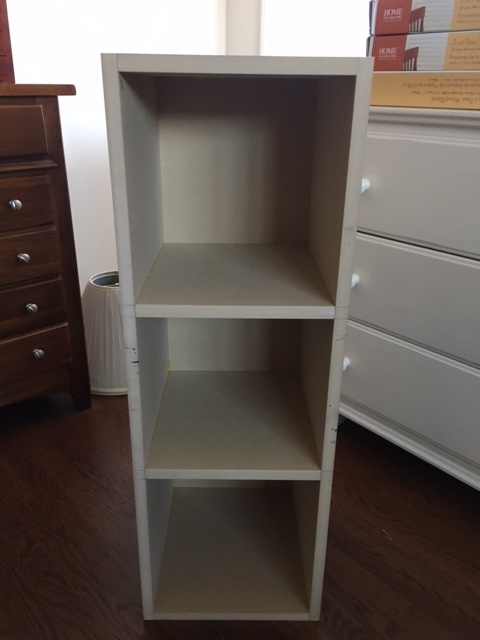 I used a 1/4" drill bit to drill all of the holes - my drill would not fit inside perpendicular so each hole had to be drilled on an angle. It doesn't matter. I also used a 1/4" bit for the binding posts on the back panel spacing them 1" apart. 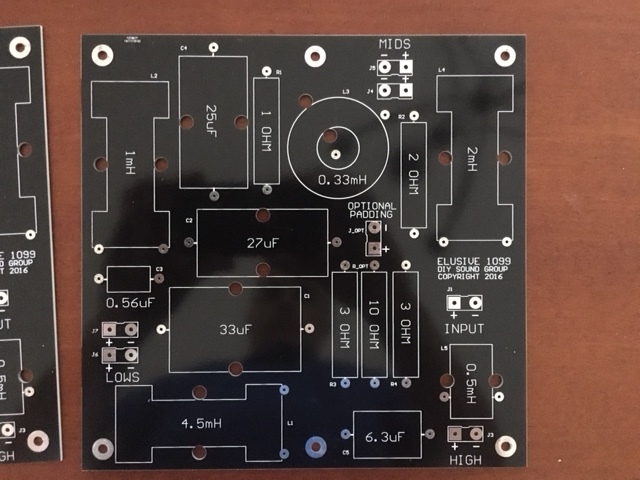 When it came time to actually mounting the crossovers, the PCB made it somewhat easy because they came pre-drilled with holes in each corner for feet/standoffs (not sure what they are called). 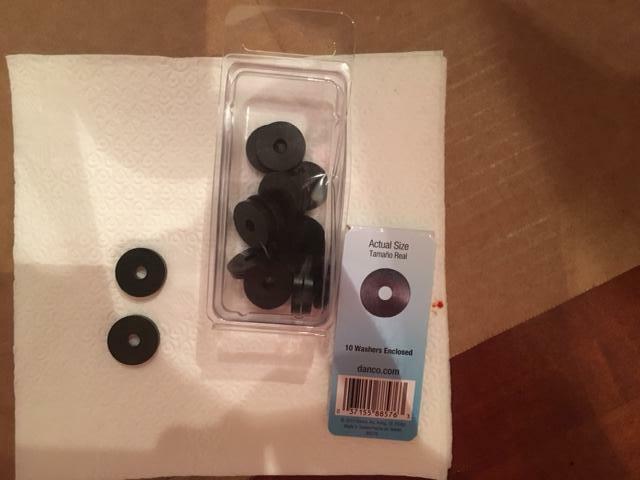 When I was at Home Depot for like the 4th time over the weekend I noticed some rubber washers in the plumbing section and thought they would work perfectly. I ended up using 2 of these in each corner to offset the board from the rear panel and used a 1" #8 screw to secure the board in place. The first thing I did was position the crossover where I wanted it to be mounted. Due to the wire lengths I shifted the boards up a little bit instead of centering them exactly. 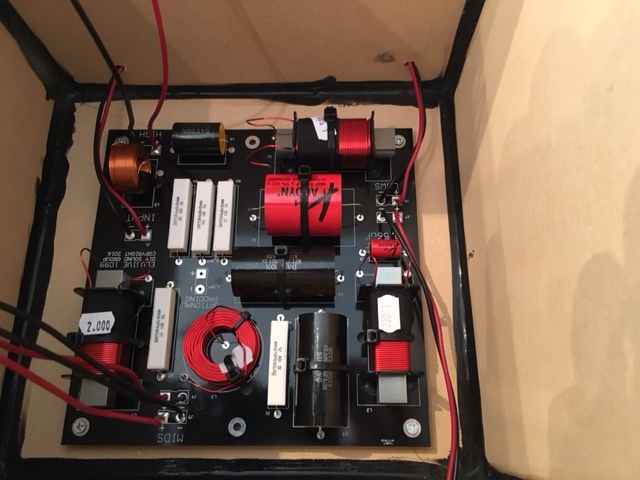 This would give me about an inch of extra wire to play with when it came time to connect the woofers, which I think will make all the difference. Next, I used a pencil to mark where the screws would go through the hole in the board. Then I removed the crossover and drilled out the 4 holes making sure to not poke out the back (I put a piece of tape on the drill bit to tell me how deep to go). Finally, I placed 2 rubber washers on each pre-drilled hole and then placed the crossover on top and screwed it in place. This took a little bit of messing around to line everything up due to the tight space but I eventually got it. You can see 2 sets of wires going into the bottom chamber (input and lows) and one set of wires going to the top chamber (lows). Finally, I used some leftover caulk to seal up the holes I drilled for the wires. Not sure if this is necessary but I figured the woofers are separated for a reason so it couldn't hurt. Next up is lining the insides with some 1" foam. Last edited by javeryh; 08-30-2017 at 07:09 AM. Alright - last night I got one of the three speakers completely lined with foam - in case anyone is curious, I bought it from Walmart HERE. 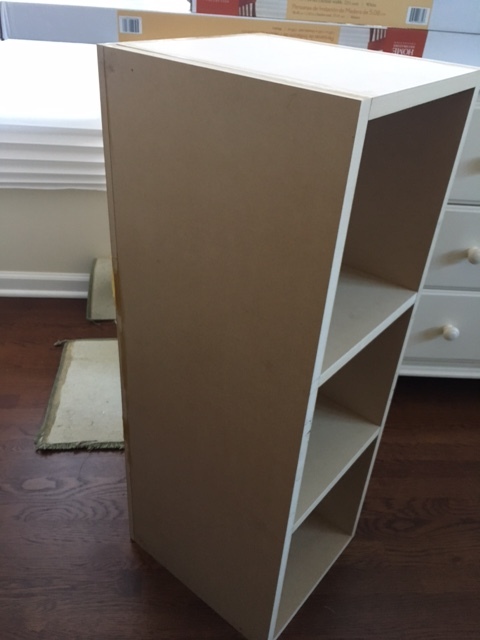 I just used scissors to cut it making loose measurements and attached it to the inside of the cabinet using a staple gun. 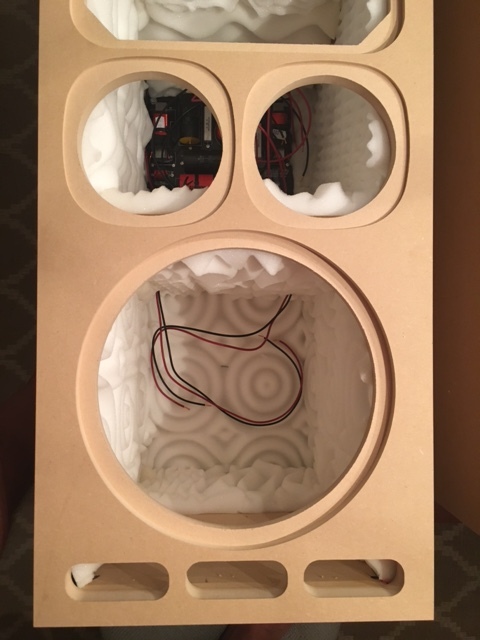 I also made sure to leave plenty of clearance around the ports on the top and the bottom of the speaker so the foam does not get in the way as some of you recommended above. The top panel lines up pretty nicely but I haven't glued it down yet. Any tips for this? I have 8 clamps that I can use to position around the box (obviously more is better) but I'm wondering if I'm missing something simple. I also did a dry fit with some of the components to make sure I had enough clearance around the foam, etc. and it all seemed good. This last shot is just a random close-up of the middle of the speaker so you can see where the board is relative to everything. That center compartment needs to be stuffed with polyfill or some type of insulation. That's my plan. How dense should it be? Just enough to fill the space or more than that? I'm not going to stuff as much as I can in there but I am trying to understand what it should end up at. Glue,brad Nailer(If you have one),then clamps.It won't slide then. I just glued up the first panel. No brad nailer. Well, I have one but setting it up in my dining room is a no-go. 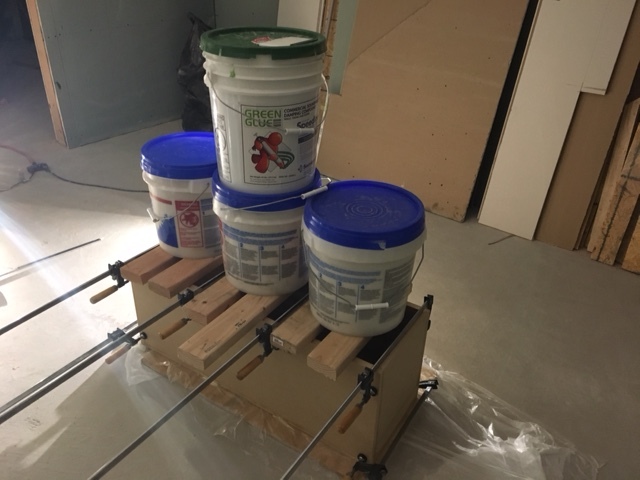 I used my 8 clamps and it seems to have lined up pretty good. How long do you guys typically leave everything clamped? Google is all over the place (30 minutes to 24 hours). Ideally I'd be able to unclamp and then glue the next one up in about 2 hours. MDF seems to bond easier than wood so I'm hoping there will be no issues. 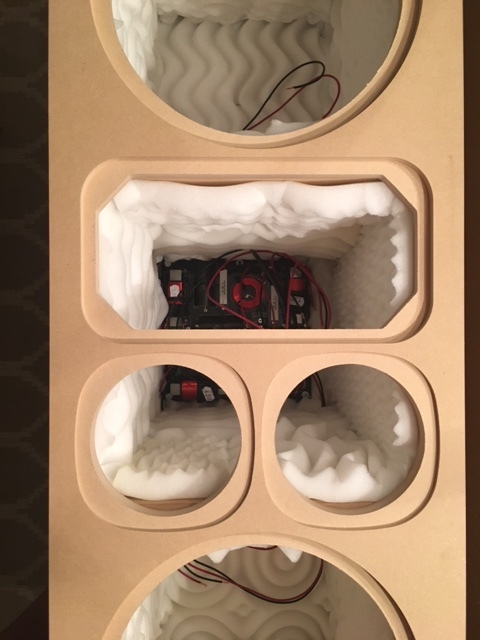 I need to have all 3 speakers glued by tomorrow morning so I can start spackling/finishing. Theater opens in 2 weeks and I have lots to do!! Any thoughts? Personally I find this style of wire stripper easier, and more flexible, to use - pretty sure you'll be able to get something similar in the States. It can remove the outer sheathing and then strip all three cores of wires at once - brilliant bit of kit, and cheap enough too! Stuff the chambers roughly 50% full but evenly spaced as a good starting place. You can always add or take away. Density should be like that of polyfill. I prefer wool batting or cotton insulation myself, but with he cotton you have to shred it and fluff it. 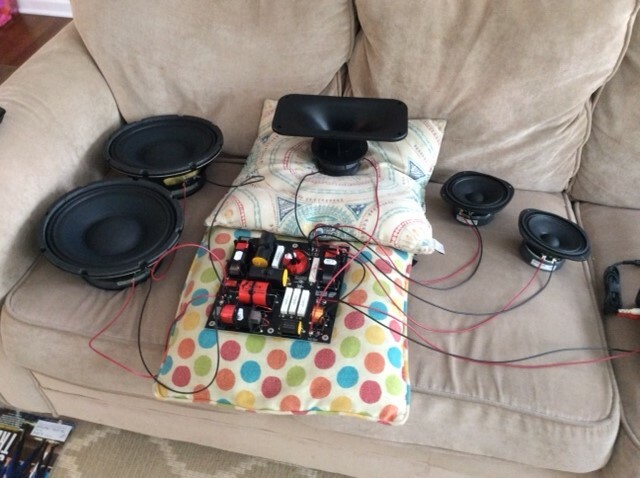 I also would suggest experimenting with batting in the woofer ported enclosures. I prefer to have batting in ported enclosures to help absorb some of the high frequency noise and dampen the port output. It lowers the q of the port and gives a more gradual response roll off. The negative is it also reduces the output at those frequencies, but the difference is small. A db or two if the batting fill is modest. If I wasn't already finished wiring I'd get one of these. They look so cool. Thanks. I already have 2 bags of polyfil so I'm going to play with that. 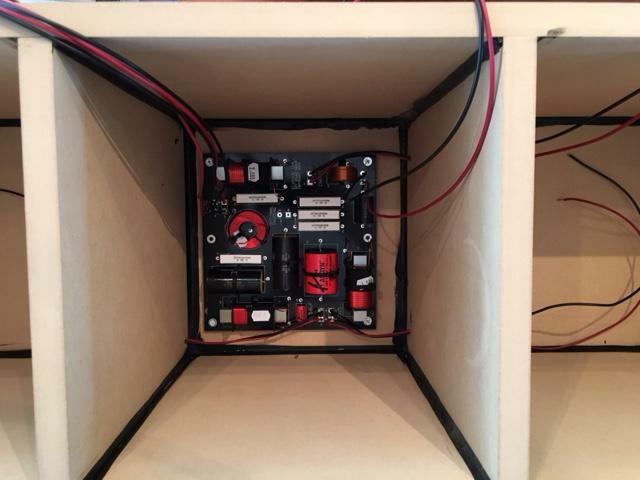 Another random question: Do you guys put "feet" on the bottom of your speakers? Or do you just rest them flat on the floor? Those should be on stands. They aren't tall enough to be used as towers with optimal tweeter height.